How do you file for maternity leave? You got pregnant: Check! You understand your maternity leave eligibility and rights: Check! [If not, read this post] You’ve talked to your manager and HR team about when you’ll start your maternity leave: Check! Now it’s time to actually file your claim…but how? 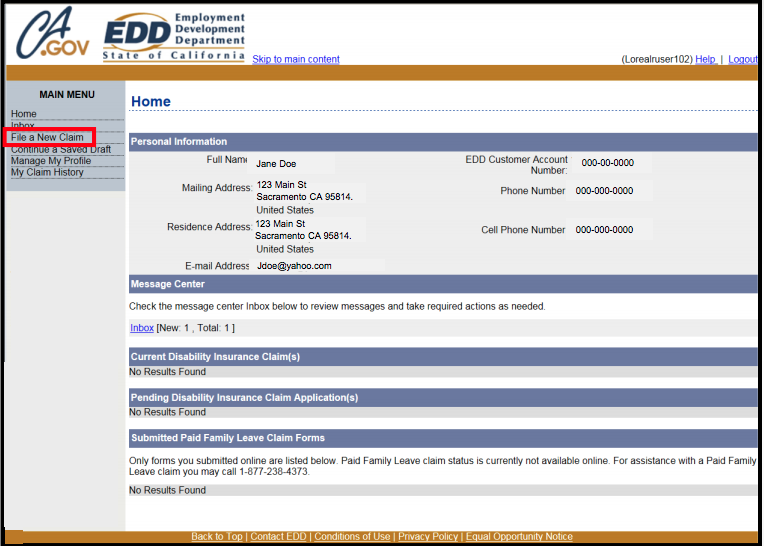 The fastest and most convenient way to file your State Disability Insurance (SDI) and Paid Family Leave (PFL) is through the EDD web site. It’s fairly easy to navigate, but there are some parts that are kind of confusing. Here’s a step-by-step with images of the important screens, courtesy of the EDD. Step 1: First thing you need to do is register for an online account by going to http://www.edd.ca.gov/disability/SDI_Online.htm. You can create your account anytime before you start maternity leave, but you won’t be able to submit your claim just yet. More on that later. 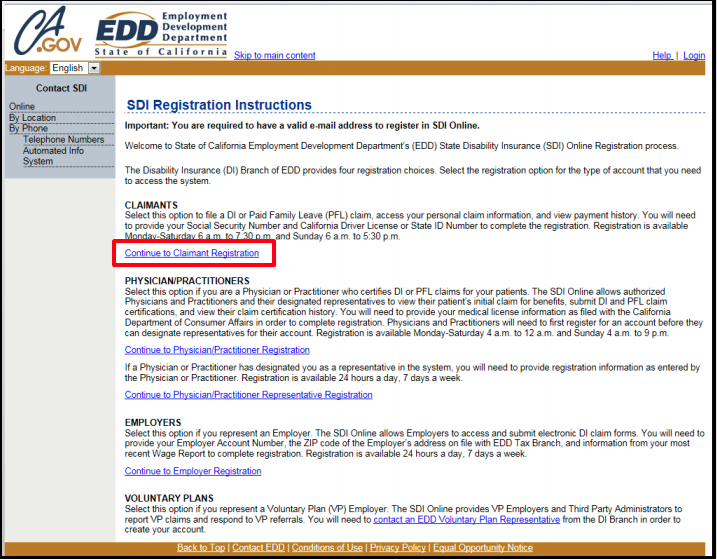 Step 2: Once you get to the SDI Registrations Instructions page, click on “Continue to Claimant Registration” in the middle of the screen. Step 3: Go through the Security and Terms & Conditions pages. 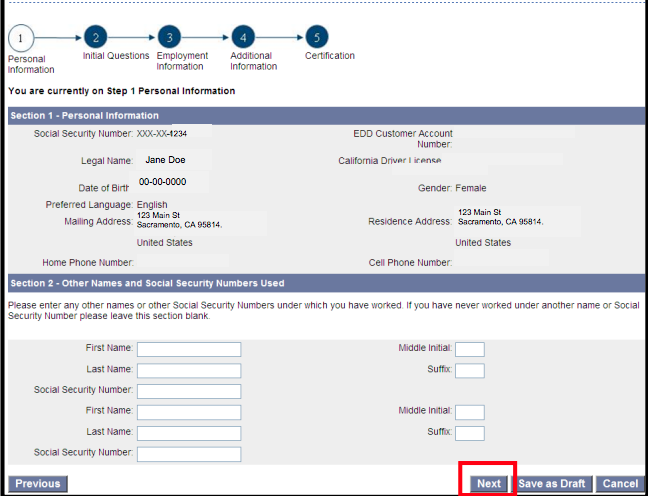 Step 4: Fill out the Account Verification Information page. Step 5: Create a username and password on the Setup Security Information page. Write down your information and store it in a safe place. If you enter the wrong credentials more than twice, your account gets frozen for about 48 hours! 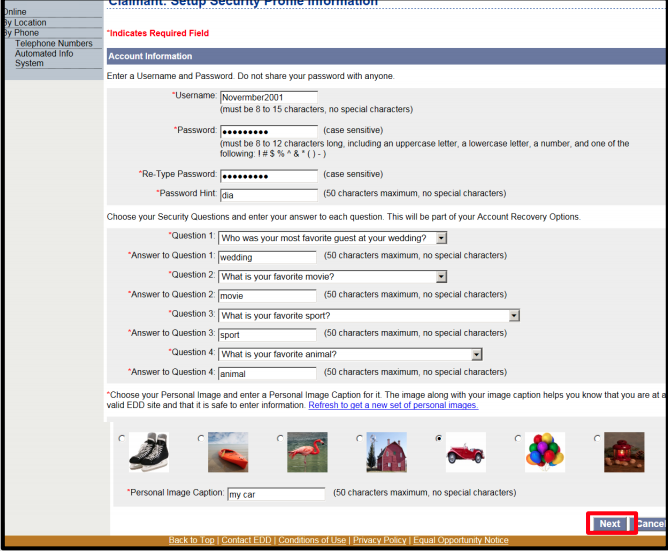 Step 6: Complete your Personal Profile Information and hit Submit. 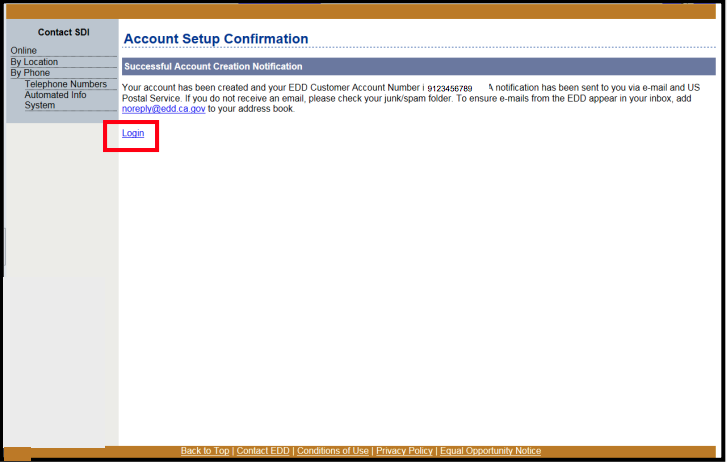 Step 7: When your account is successfully created, the Account Setup Confirmation page will appear. Try logging in to your newly created account to make sure it’s working! Now that your online account is created, you’ll be able to submit your DI claim so that you can get PAID while out on leave. Hooray! An important heads up: you won’t be able to submit your DI claim until the day you start your leave. 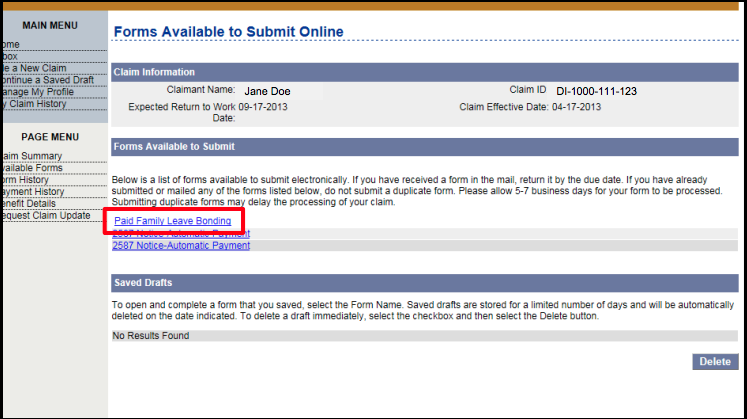 If you try to submit the claim before the actual start date of your leave, the system will give you an error message. So, if you’ve created your online account ahead of time, make sure to set up a calendar reminder to complete the claims bit! Step 1: Log in to your account. Make sure to type in your username and password correctly. It’s worth noting again, if you make several failed attempts the system will lock you out for an extended period of time (around 48 hours)….and it’s SOOO frustrating. In some instances during the log-in process, you may be asked to respond to one or more of the security questions that you set when you created the account – make a note of those answers for future reference too. 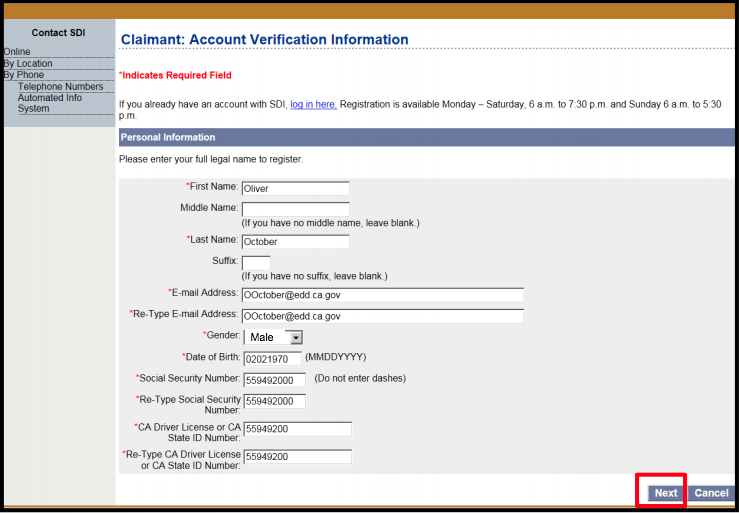 Step 2: Once you’re logged in and at the Home page, select “File a New Claim” from the Main Menu on the left side of the screen. Step 3: In the next page, select “Disability Insurance.” Step 4: Read the Disability Insurance Claim Filing Instructions page, and hit Next. Step 5: The next screen is the Personal Information Page. Info that you’ve previously entered during the registration process will automatically populate here, but just verify that everything is correct, and hit Next. “Before your disability began, what was the last date you worked”: This is the last day you were physically in the office. “When did your disability begin”: Typically that’s the next business day following your last day worked. Make sure that this date is consistent with what your physician has submitted and/or any Certification of Healthcare Provider paperwork. “Date you want your Disability Insurance Claim to begin if different than the date your disability began”: In some instances, it makes financial sense to delay your claim start date since the EDD uses your highest-paid calendar quarter during the 12-month base period to calculate your disability payment amount. Check out this post to find out more on how to optimize your disability start date. Step 7: Enter your company’s name into the Employer Search field. If a match comes up, hit Select. If your employer is not listed, select “Not Found” and you’ll be able to add them in the next screen. 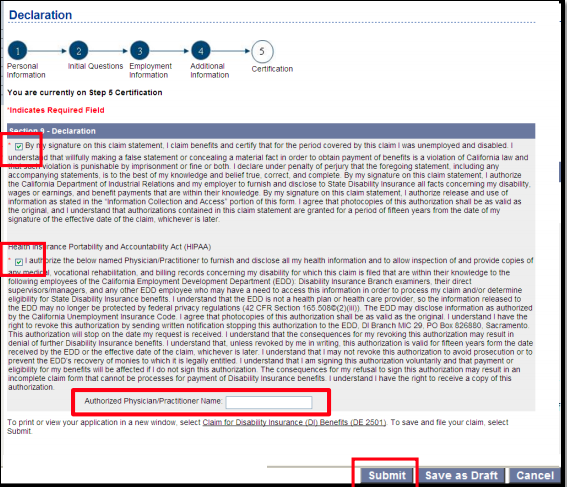 Step 8: When you get to the Declaration page, select the first check box to authorize an electronic signature. Do the same for the second check box and enter the name of your physician/practitioner in the field. Both boxes must be selected to complete your claim. Now, hit Submit to finalize the process. 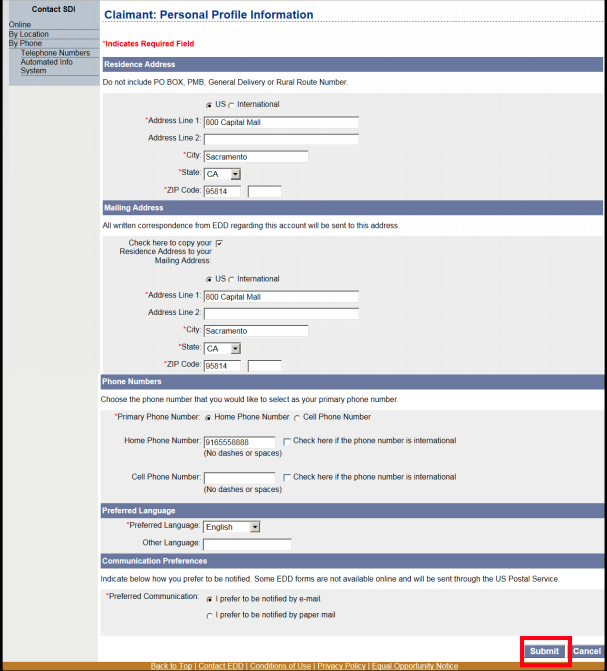 Step 9: The Confirmation page will provide a Form Receipt Number – this is super important. You must give your doctor that Form Receipt Number so they can submit their Physician Certificate for your claim. You can also click on the receipt number to print a PDF of your claim. You’re done with filing your SDI claim! The EDD usually takes about 14 days to review and process your claim. Once everything has been approved, you’ll receive a Notice of Computation Letter (mine came in the mail, but I think people have been getting them via email recently) that explains your benefit award for your claim as well as the wages used to calculate the award. If all goes smoothly, you’ll be paid every 2 weeks via the EDD debit card. 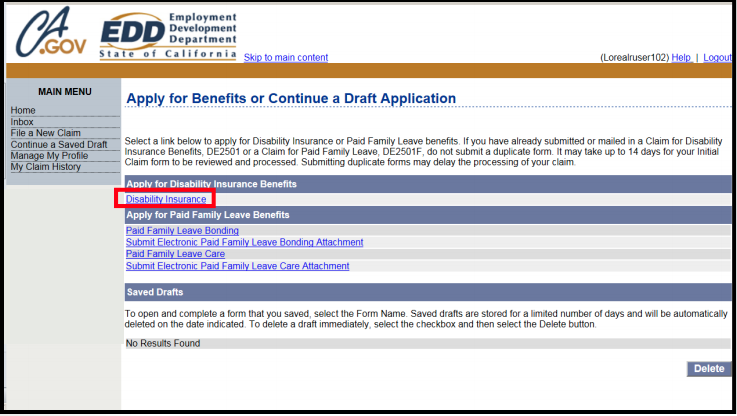 Sometime before the final date of your SDI benefits, you’ll get a notice telling you it’s time to file your Paid Family Leave bonding claim. Note, you won’t be able to submit PFL until you’ve stopped receiving SDI. So, if your SDI ends on July 7, submit PFL on July 8. The process for PFL is pretty much the same as SDI. 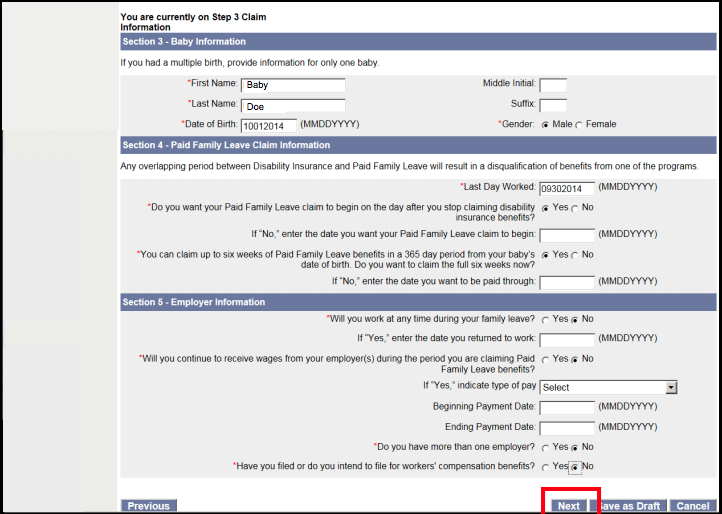 Step 2: You’ll then be directed to the Message Center, and you should have the “Form DE 2501 FP Claim for Paid Family Leave (New Mother)” link waiting in your inbox. 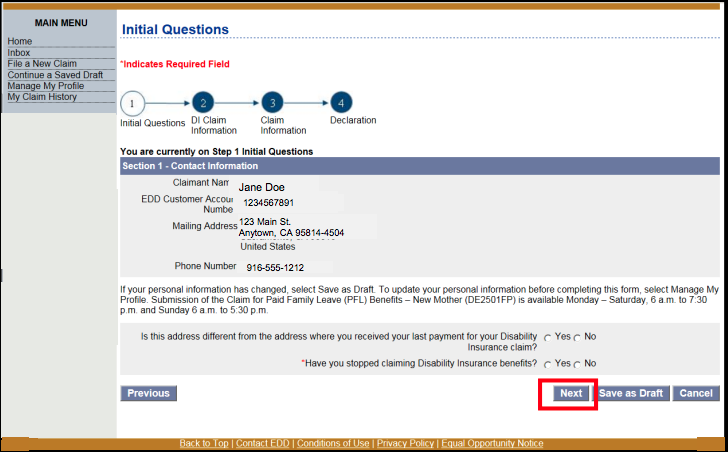 Step 3: Open that message and click the “Forms Available to Submit” link to begin filing your PFL claim. Step 5: Answer yes to both questions on the Prescreening Questions page. Step 6: More questions….answer the following on the Initial Questions page. As previously mentioned, you won’t be able to submit PFL until you’ve stopped receiving SDI. 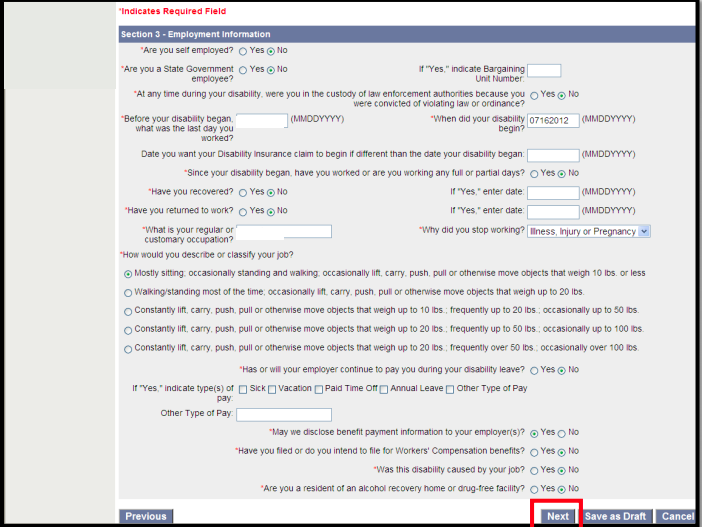 If you try to submit while you’re still receiving SDI – and answer NO to question 2 – you’ll get an error message saying not to submit PFL form until you have stopped claiming disability benefits. 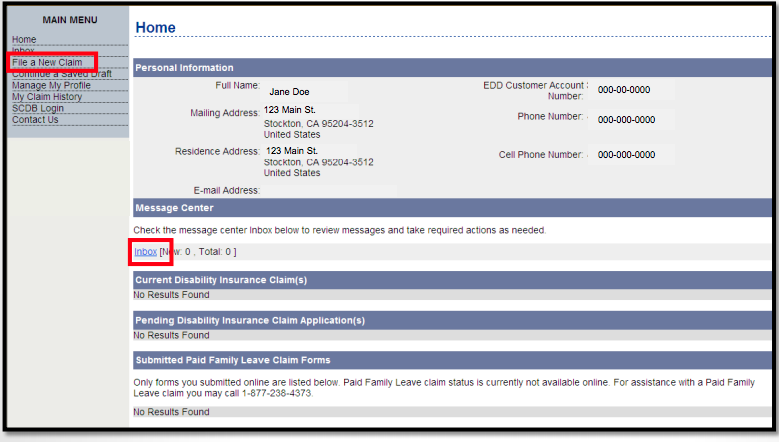 Step 7: Review the DI Claim Information page. If everything looks good – pay special attention to the Final Date date – hit Next. Step 8: Complete the “Baby Information,” “Paid Family Leave Claim Information,” and “Employer Information” sections on the next page, and hit Next. 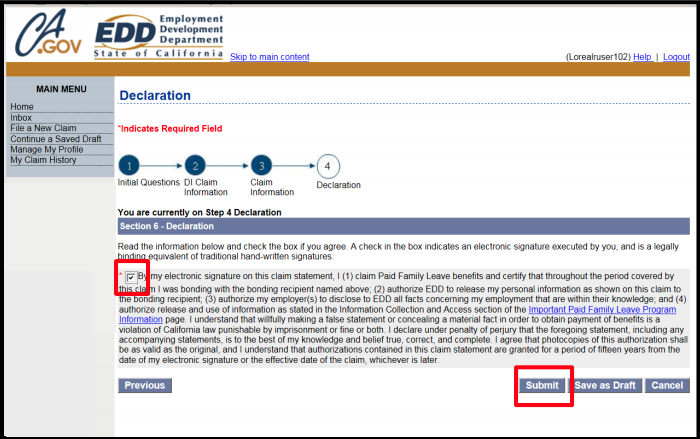 Step 9: At the Declaration page, check the box to authorize your electronic signature. Hit Submit to finalize the process. 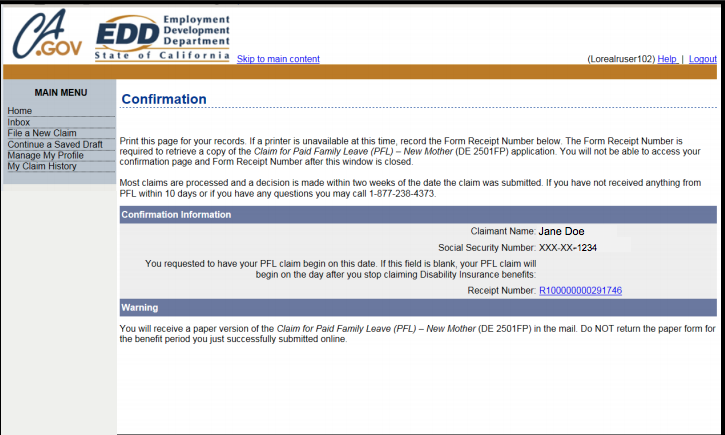 Step 10: Read the Confirmation page, and you are donezos with filing your PFL! The EDD will take about 14 days to review your claim. Similar to SDI, once everything is approved you’ll get your payments via the EDD Debit Card. You betcha! Glad to hear it was helpful! Thanks so much for a helpful post. I have a quick question though, if I wanted to break up my PFL into two chunks of 3 weeks each. How do I file that? One right after the end of my SDI and the other right around Christmas. When filing for PFL intermittently, you answer “no” to the question asking if you will be taking all 6 weeks at once. You’ll then enter the date you want to be paid through for the first stint of PFL. You’ll be sent a PFL re-establishment form with your final PFL payment for PFL chunk #1. When you’re ready to take PFL chunk #2, send in that form. Thank you so much for all this. I do have a question about continuing on to PFL after filing for SDI. According to my HR dept at work, my return to work date after a c section is Oct 6th. I can file for PFL on Oct 7th. Putting the answer YES to the question “are you still receiving SDI” is me telling them my 8 week is up and I would like to start the PFL, correct? Or is there another place I need to go to end SDI benefits? I just want to make sure I’m doing the proper steps in stopping SDI and starting PFL. You can’t file for PFL until you are finished with SDI. So, if your SDI ends on Oct 6, then the earliest you can file for PFL is on October 7. You cannot file in advance. That said, note that PFL is only wage replacement and does not provide job protection. If your HR is telling you that you are to return from leave on October 6, that would indicate that you are not CFRA eligible (or that your employer is not aware of your CFRA eligibility). Please confirm CFRA eligibility with your HR before filing for PFL. You can email me directly at maternityleave411@gmail.com for further questions. My last official day of work is January 4th, but my due date isn’t until January 12th. For the one week prior to giving birth, what do you recommend I do? Should I (or do I) need to start my SDI or should I just use my PTO and then start SDI after the baby is born? Glad to hear the post has been helpful! Definitely file for SDI as of the first day of your disability. If your last day in the office is Jan. 4, you can file for SDI on Jan 5 (it doesn’t matter it’s a Saturday since the EDD goes off a 7-day workweek regardless if you work M-F). The first 7 days of your SDI is a non-payable waiting period. You can use PTO to pay yourself during this time. Once you serve the 7-day waiting period, your SDI benefits will kick in. I just love your blog. SO HELPFUL! Question regarding the EDD form your doctor has to submit- Can they submit it prior to your first day of disability/prior to you filing a claim? Or should you wait to have them fill out the form until you file the claim? My doctor made it seem like I can drop off the EDD form 2-4 weeks before my due date for them to fill out and submit. Also, I plan to file my claim online. My Dr will then mail/fax their form. Does that sound okay?